Buy 1 for $7.28Buy 2 / Save $0.39!Buy 3 / Save $1.46! Looking like rushes or bamboo, the horsetail herb is also known as horse willow, toadpipe, and bottle brush. It's a perennial flowerless plant whose health properties are found in the hollow, jointed stems. 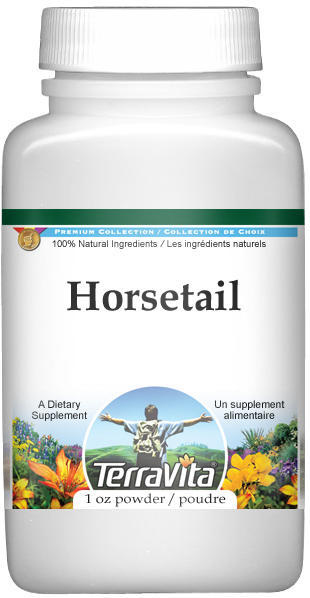 Horsetail flushes fluid from the body and is a mild diuretic. It's useful for the potential to help support symptoms of wounds, in combination with other therapies. It also has the power to help knock out bacterial and inflammatory problemss of the lower urinary tract and flush out kidney and bladder stones. The fresh or dried, green stems of horsetail, collected in summer, contain silicic acid and flavonoids. Its diuretic quality comes from the chemical ingredient equisetonin. German health authorities say that horsetail's silica and silicic acid doesn't test out as a useful product for bleeding tubercular lesions-contrary to some advocates of the herb. Internally, use powdered herb for infusions, taken orally in an average daily dose of 6 grams. Externally use 10 grams of powdered herb in 1 liter of water for compresses. If you take horsetail internally, drink plenty of water.